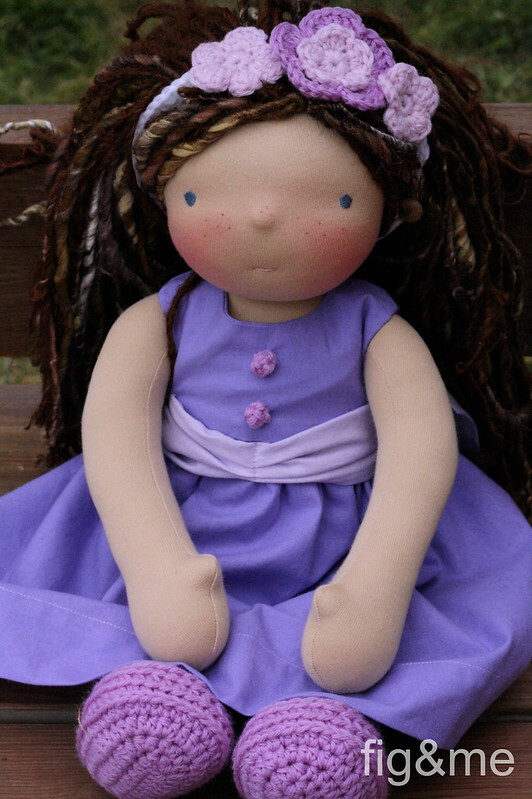 I just finished this sweet custom doll. I didn't envision her this sweet, but I guess her true personality came about as she was made. 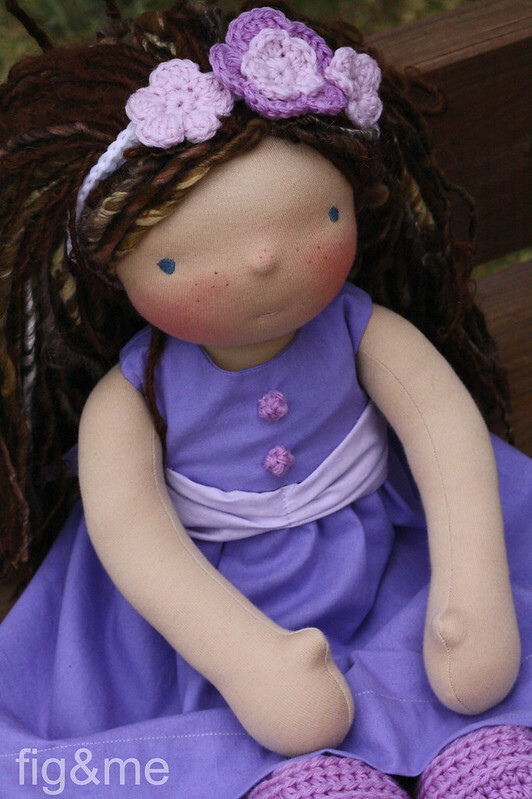 Sweet Aida will be a sister to another pretty doll called Alice, who serves as a life companion to a wonderful and bright little girl that goes by the name of Audrey. Now Audrey loved seeing the Royal Ballet's Alice in Wonderland performance, and asked that maybe her new doll could have a dress "just like Alice". So I tried to make something along those lines for little Aida. I have been thinking a lot about this doll, on and off, since Audrey's mother got lucky on the custom spots drawing a few months ago. My first instinct was to make a doll just like Audrey, whose ethereal beauty is extremely inspiring to me from the dollmaking point of view. 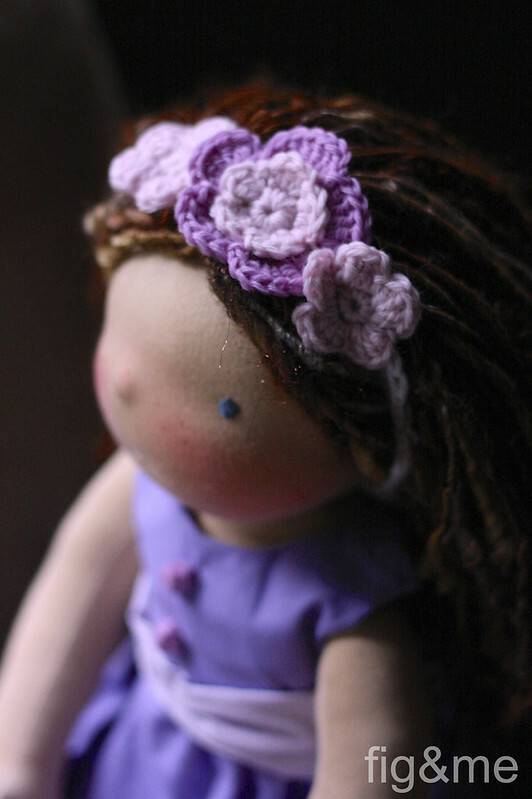 But of course, the majority of the time when I create custom dolls I have to "oblige" so to speak to the wishes and dreams of the intended recipients. Most of the time, everybody allows me to bring forth my vision for the doll, which is extremely nourishing and comforting to me. 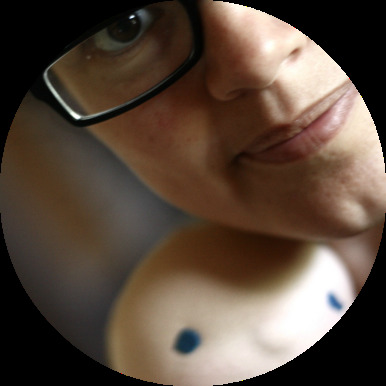 There is little pressure for me to match my vision to something else, but in this case, I wasn't feeling stressed or anxious about matching Audrey's vision for her doll, but more so in creating something that would speak to her inner self. A doll that she seems to need at this point, a new friend, an extra shoulder to play on and lean on, a sister for her doll Alice. Little Audrey also asked for "hair that would blow nicely in the wind". What a wonderful picture she painted for me!. So I commissioned some lovely handspun suri alpaca, which is extremely soft, but also light, so that little hair wisps can blow softly in the wind, just like Audrey wished for, plus some of my very special Luxfish handspun yarn, which comes with lots of fibers and colours mixed in. 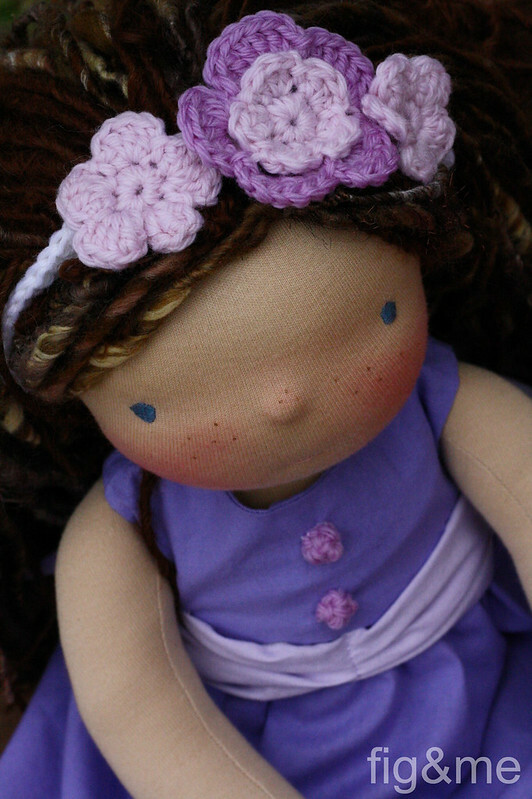 Her head is crowned with a crochet flower headband to keep some of those locks off her face. Now, the name of sweet Aida came to me in a book. I was reading a lovely book (Tasha Tudor's Heirloom Crafts by Tovah Martin) and in it the author mentions that Tasha's dress-form is called Aida. The way Tasha speaks about Aida reminded me of what a doll is to a child: a dress-form which they clothe with their dreams and fears, with their wishes and aspirations. They use the doll as a seamstress uses a dress-form: to try out if something fits, if a theory pans out; they re-live episodes in the same way a dressmaker goes over a design with a muslin first. I immediately thought of this doll, of Audrey, and I thought this name was very suitable for her doll. Whilst Audrey might very well choose a new name for her doll, I felt positive that the energy within this name would also suit her. 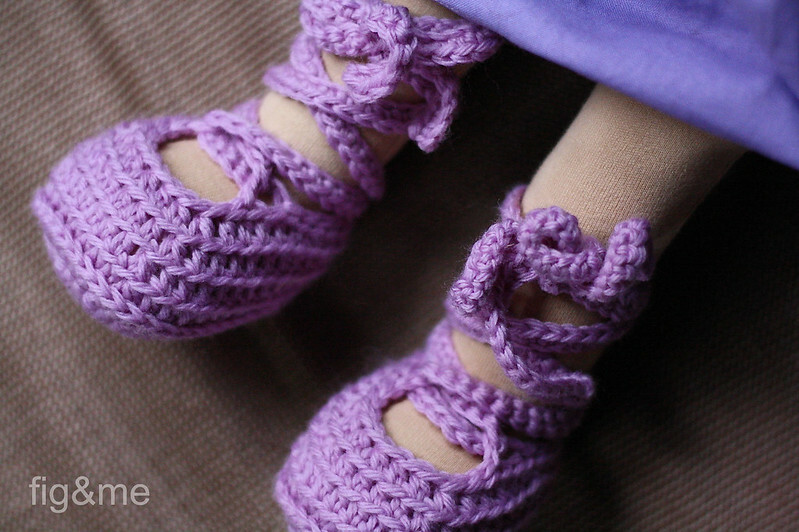 I hope that come Christmas morning, little Audrey giggles at what my hands made for her. She knows I am making a doll for her, and she is very excited, as we all are. One of the many joys of the dollmaker comes at this special time of the year, in which many, many children all over the world, will get to meet their new friends, made with our own two hands! To be part of the childhood memories of children whom I have never met, ah! what a beautiful reward. Thank you Amber and Audrey for giving me this wonderful opportunity, I hope you enjoy playing with her for many years!